is professor of history at the University of Sheffield. His latest book is The Common Freedom of the People: John Lilburne and the English Revolution (2018). 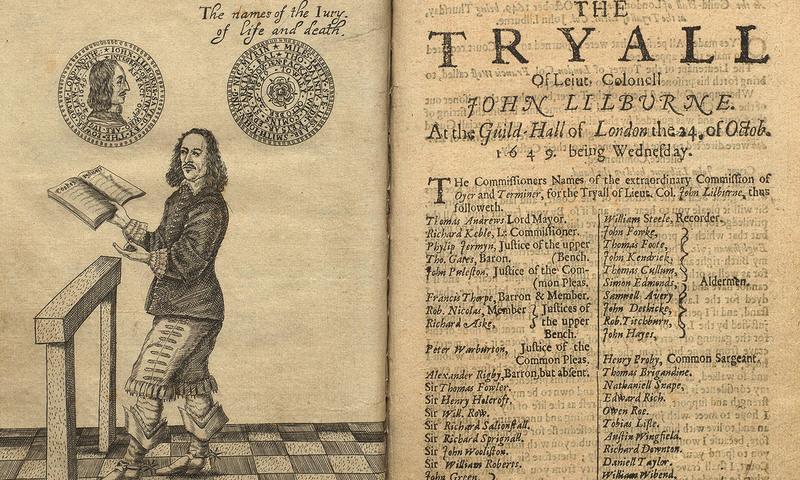 The English activist John Lilburne (1615-57) is now remembered as one of the leading Levellers – campaigners for a government based on popular sovereignty, two centuries before the advent of mass representative democracy in Europe. But that was only part of a longer public career in which he took on every government he lived under, displaying extraordinary courage and fortitude, and in the process championing legal rights that are important to us all. For example, having been arrested on suspicion of importing illegal books in 1637, Lilburne refused to plead. For this contempt of court, he suffered a fearsome beating through the streets of London, as he stumbled from Fleet Prison to Westminster yard, tied at the ‘cart’s arse’. He received 500 strokes from a triple-corded, knotted whip, which left his shoulders swollen like ‘penny loaves’ and his back striped with ‘welts like tobacco pipes’. Placed in the pillory, he was gagged so roughly that his jaw bled. This aimed as much to humiliate as to silence him – gagging was fit for animals, not the son of a gentleman. Lilburne triumphed over these torments, though, distributing the very tracts he was accused of importing, and forcing the Privy Council to change the choreography of future punishments to avoid a repetition of this embarrassment. All the same, he subsequently languished in prison for three years, refusing to submit to the authority of the court, before he was released by Parliament along with other victims of Charles I’s regime. He later declared himself a man who did not fear ‘Greatnes or Threatning’ and it is hard to disagree. This punishment for contempt was later overthrown, establishing an important precedent for the right to remain silent. This was the first of his many brushes with the law, but the cause for which Lilburne suffered shifted across the years. He was tempted into the trade in illegal books because he thought that servants of anti-Christ had taken control of the English Church, making it part of that ‘smoaky pollitique State of the Crowned Locusts or Roman Clergy’. However, 12 years later, we are on more familiar ground. The regime that had executed Charles I put Lilburne on trial for treason, claiming that he had incited the army to mutiny when he urged them to protect the people from the new government’s incipient tyranny. Now self-consciously defending ‘the common freedome of the People’, Lilburne denounced the new government as a self-interested faction. This dramatic change in Lilburne’s political anxieties is intrinsically interesting – the journey from an apparently absurdly hyperbolic argument that seems downright loopy for many modern readers to a much more recognisable set of fears. But it also reveals the broader creativity spawned by this political crisis, a period the historian J G A Pocock called the ‘epic years’ of the English political imagination. Lilburne’s faith remained important throughout his life. Indeed, he often took on the mantle of the Christian martyr. He hoped to prove the righteousness of his cause through his willingness to suffer for it, while revealing the hypocrisy of his persecutors by forcing them to show their teeth. He also constantly referred to biblical history and scriptural example to explain what his sufferings were really all about: why other people should care. These sufferings were genuine. Following that fearsome beating in 1638, he had been imprisoned in conditions that were at times appalling, perhaps even life-threatening. Twenty years later, dead at the age of 42, he had spent more than half of his adult life in prison or exile, and survived three trials for his life. He had also seen very active military service in the parliamentary armies. In all this, he consistently claimed that his religious faith gave him the necessary strength to endure and prevail. It is striking, though, that he never claimed to suffer for a particular religious group. Instead, he said his battle was for the legal freedoms due to all Englishmen: ‘There [is] not one particular I have contended for, or for which I have suffered, but the right, freedom, safety and wellbeing of every particular man, woman and child in England.’ He struggled on behalf of all those born to these rights, even those whose religious opinions he knew to be false. Put another way, he was consistently prosecuted for what he published not what he did; and he consistently wrote about his legal rights not his faith. His was a secular martyrdom. This takes us to the heart of a larger and longer transition in European politics. The Reformation had made religious difference central to political life. Regimes now had religious identities – as Catholic, Lutheran or Calvinist, for example – and that created a pressure to suppress alternative and potentially subversive versions of Christianity. It also lent an edge to international rivalries, giving religious justifications for war. Lilburne emerged from this world of Reformation politics but expressed his religious conscience in a very different way, based on a sharp distinction between the civil state and the ecclesiastical state. The civil state was governed by human laws, which he acknowledged to be binding. He consistently said that he would submit to just prosecution according to the law of the land. The ecclesiastical state, by contrast, was governed by scripture. The Church was not a national body, and it was not under the jurisdiction of national governments. For Lilburne, religious conscience (and that of his religious enemies) was regulated by God, not the government. He did not fight to achieve a religious reformation, therefore, but against civil tyranny – ‘not in the least, in opposition to a just Government, having alwaies … had the Law of England on his side’ (my emphasis). These arguments take us from a world of Reformation politics – in which the key political questions were about the purification of Church and society inspired by a vision of the true faith – towards a world of Enlightenment politics – where the key political questions are about our rights and duties as subjects or citizens. It was a larger and longer transition of course, but in that transition Lilburne’s arguments survived better than those of his more explicitly religiously engaged contemporaries. They were important to radicals of the 1790s, to the British Left in the 19th and 20th century, to 20th-century libertarians and (for example) to Hugo Black, a relatively conservative judge in the US Supreme Court in 1937-71. In fact, we are still having some of the same arguments, and we share many of his concerns in a way we do not with most of his contemporaries. Lilburne’s experience was unique, of course, but it reflects broader features of life during civil war and revolution. Having taken up arms against the king, he had a kind of Animal Farm moment, realising that the parliamentary pigs might be no better than the royalist humans had been. This convinced him that the war was not really between king and parliament, so much as between the people and tyranny. Many others experienced this kind of epiphany, often prompted by the same crisis moments, although they took very different paths. Lilburne’s experience was in that sense just one particularly striking indication of how profound a crisis the English Revolution really was; and the transformation of his political views is but one example of the remarkable creativity it spawned. The Common Freedom of the People: John Lilburne and the English Revolution (2018) by Michael Braddick is published via Oxford University Press.